People need each other. We live on Earth where everything is interconnected. There is nothing separate. All life is connected through the Soul, or Spirit. 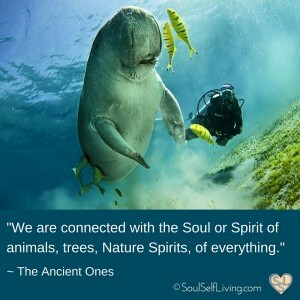 We are connected with the Soul or Spirit of animals, trees, Nature Spirits, of everything. Knowing this spiritual truth gives one reverence for all life. Knowing how much we all depend on everything working together for the good of all helps us to be more genuine in our caring for each beautiful Soul. When the ego-mind is permitted to act against life itself, we find ourselves in jeopardy. The Earth and all of her inhabitants are relying upon each one of us to hold each other accountable for the well-being of life. Will YOU do your part? Are you an advocate for life? Will you step up to become an activist? May we all consider doing more to achieve the life that we desire to create as a human race upon this lovely planet?